How to get rid of oily skin permanently using our pieces of advice on skincare and food as well as general tips, which are likely to help you to get rid of such problem. The problem of oily skin usually appears in teenagers; however after sexual maturation the excessive oil secretion does not always go away. The result of intensive oil secretion is usually reflected in oily shine, blocked pores and pimples. In order to avoid all these troubles one needs to organize proper skincare for the oily type, the main goal of which is narrowed to decreasing the amount of shine, diminishing big pores and controlling the work of oil-bags. Proper skincare lowers the risk of having acne and pimples and you permanently look healthy and fresh. So, if you are looking for the ways how to get rid of oily skin permanently, make sure you read our recommendations. After you applied your make-up, it quickly disappears and you always need to correct it by using your face powder from time to time. Oily shine appears almost immediately after washing. The presence of such symptoms usually speaks about oily skin type, which requires thorough and complex care. Any skin drawback hints about possible problems with health. Oily shine is the straight indicator of something bad happening in the organism. How to get rid of oily skin permanently by means of proper skincare? Problem skin is inclined to have acne. Due to the intensive oil secretion pores get blocked and oily shine appears. Full skincare at home is able to show you how to control oil-bags’ work and significantly improve the condition of oily skin. First of all, oily skin required regular cleaning. However, it’s important here not to go too far. Do not wash your face more than twice a day; otherwise, oil-bags will start working even more. Hot water also activates oil secretion, that’s why you need to learn how to wash your face with cool water. To wash your face you should pick soft gels and foams with neutral pH. If your pores are blocked with dark spots you should consider trying facial wash with AHA-acids. In order to clean your face more thoroughly, learn how to apply the facial to the natural sponge first. Instead of sponge you might also get a special cleansing brush. Additional cleansing by lotions and tonics. After facial wash you need to apply tonic without alcohol or acetone, because they dry your skin too much and send a signal to the oil-bags to increase oil secretion. Just apply a few drops to the clean cotton disk and gently clean your face and neck. Additional cleansing of oily skin by alcoholic tonic is acceptable only in case there are some inflammations. Deep cleaning by means of peeling. Oily skin permanently requires deep cleaning – peeling or exfoliation. Twice a week use scrub, but avoid too rough and aggressive products. They will only damage your appearance, as a result of which you might get inflammations or irritations. The perfect option for oily skin will be scrub with fruit acids. Regular usage of masks decrease oil secretion and improve the face tone. You can buy such masks in many stores, which sell skincare. Use masks with AHA, BHA and enzymes only twice a week (the excessive usage will only stimulate) in order to make the circulation and oxygen metabolism in the skin better and make it brighter by removing dead cells. It can also show you how to control the reddening. Besides, one can learn how to make a face mask for oily skin at home. Dissolve one tablespoon of white or green cosmetic clay in water to make mush. Apply to the clean face for 10-15 minutes and get rid of it with cool water. Hydration and nutrition of the oily skin. You should buy only light products for hydration and nourishment, because they were made for your skin type specially. Instead of cream you may think how to use cosmetic oil for oily skin – hazelnut, wine-stone or jojoba oil, because they make your skin matte, control oil secretion and improve the face tone. 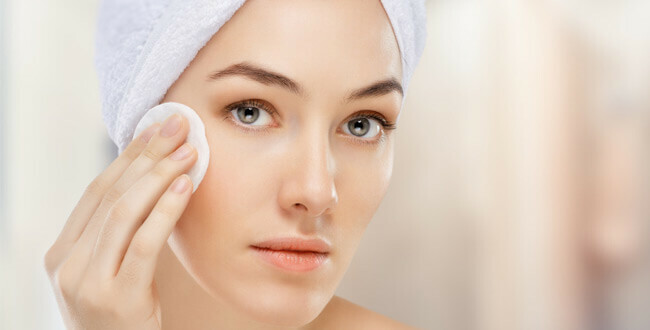 Learning how to get rid of oily skin permanently one needs to learn not only useful things, which will be able to help you improve the epidermis condition at home, but also about things, which can make the situation permanently still worse, in order to get rid of them in the future. You should agree that sometimes chasing fast results the girls start “actively” taking care of their face and trying everything they can come across, and as a result they get not the matte skin, but still much shinier one. Very often women use too strong product to take care of their skin. They dry it too much and the epidermis tries to restore the losses and starts to make even more secret. You’d better use softer products three times a day than only a rough product once in the morning. Many people believe that bad condition of oily skin is the result of eating too much sweet, having certain lifestyle and lack of skincare. So, they start keeping exhausting diets, buying strong cosmetic products, and accompany all of it with stress. In this case these aggressive actions will be the reasons why the epidermis’ condition only gets worse. If there is no possibility to define the reason of excessive oil secretion on your own, you’d better turn to a specialist and avoid conducting experiments on yourself. Wrong choice of products for acne treatment or oily epidermis is able to ruin your beauty permanently. If you take them regularly and the skin’s condition does not improve, perhaps, you need to change the approach to the treatment and try other options of how to get rid of the problem. 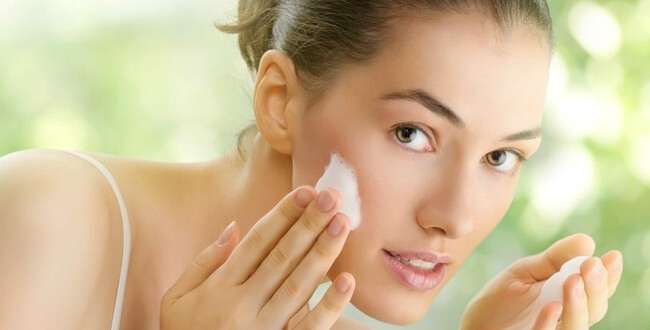 Too frequent exfoliation at home made from natural ingredients even for oily skin may have too strong effect and the skin will try to come up with the protection from the permanent stress and will produce much oil. You should never go too far even using gentle facial wash. Follow the instruction and if it says to use it twice per week, you should never do it every day. 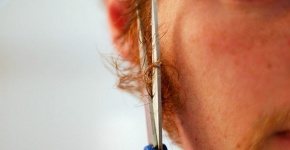 Mind the peeling should even be eliminated in case your skin has some inflammations. How to get rid of oily skin permanently by means of food? Nutrition plays a very important part in human’s health. There is a long list of products you should avoid, if you have oily skin type. There also exist products, which are extremely useful and even help you to get rid of oily skin permanently. Fiber consumes the needed nutritive substances and helps to get rid of the toxins from the organism. Eating products, which are rich in fiber, such as brown bread, oats, corn and citrus fruit improves the skin’s elasticity and keeps it clean and fresh. There is nothing better than water. Water is known to clean and remove all toxins from the organism. Drink water within a day to hydrate the organism from within and make your face look fresh. Clean water is better than any other drink. A cucumber is known to contain 95% of water. It has antioxidant characteristics and hydrates your skin. Besides, it has a cooling effect on the skin and shows it how to reach healthy and fresh appearance. Grape-fruit is rich in fiber and has about 90% of water. It is also rich in vitamin C, which assists the organism in getting rid of the toxins. It is advised to eat grape-fruit fresh or drink grape-fruit juice without sugar. To have healthy skin you should chose the products, which are rich in omega-3 fatty acids, because they have anti-inflammatory abilities. Avocado, soybeans, nuts, tuna and salmon have plenty of omega-3 fatty acids. There are antioxidants in the following products: blackberry, beans, cranberry, apples, cereals, spinach and pepper. In other words, all bright fruits and vegetables contain antioxidants. You should get vitamins, iron and other microelements. Even a little lack of vitamin B2 can lead to oily skin. Yeast, wheat germs and organic meat are the sources of vitamins B5 and B2. Some other sources of vitamin B2 may be the raw corn, beans, nuts and royal jelly. Buckwheat, beans and rice permanently fill our body with iron and make your skin look younger. Care and food are not the only helpers on getting rid of oily skin permanently. If you do not stick to some general recommendations, or in case you have dreadful habits, you will bring to nothing the effect from cosmetics and food. Do not smoke and avoid drinking alcohol, because these are the two beauty curses. Nicotine does not only ruin lungs, but also assists in the skin’s loss of elasticity and makes the skin oily and pale. The main reason of oily shine is having blocked pores; that’s why you should not go to bed until you remove all make-up. You should not save money buying cheap foundation cream. Pick the one of high quality, which lets your pores breathe. Zones with visible reddening and inflammations can be hidden by a special pencil with greenish tone. Face powder, which is applied by soft touches, will make your skin matte and silky. Nevertheless, remember to clean the powder puff very often, lest any bacteria get there. Wash your pillowcases very often. If mud and oil is gathered on your pillowcase, when you sleep you’ll take them back to your face. Wash your pillowcases with soft soap powder once in a few days and as a result you’ll notice great changes in the amount of oil at your face within few months. Practice relaxation techniques or meditation to cope with stress. There is a tight connection between how you feel yourself psychologically and how healthy the skin is. Stress often becomes the reason of your pimples and oily skin. Have a proper sleep and sleep from seven to nine hours per day. When you sleep your organism restores and renews your skin. Permanently having lack of sleep will negatively result on how healthy you are. Drink your norm of water to hydrate your skin from within. 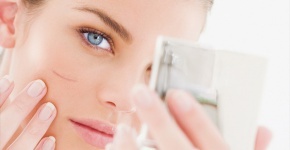 Hydration is considered to be one of the most needed elements for your skin’s health. Water fills your cells and preserves the balance of oil and water. One may solve a problem of how to get rid of oily skin permanently only applying complex approach. Provide your derma with maximum attention, clean it, use proper cosmetics, eat right food, and follow general recommendations to make it beautiful and healthy. Regularity and carefulness in doing all required procedures are sure to help you avoid problems, connected to this skin type and will definitely let you enjoy its health and cleanness.